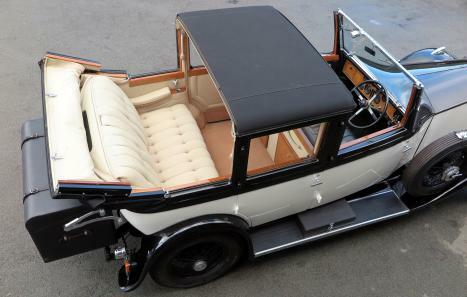 An unusual and very desirable car, being an American built Landaulette de Ville (sometimes known as a 'Sedancalette') opening at the front and the rear, making it versatile and practical in many ways. The car is in lovely condition throughout following high quality major restoration work in New Zealand in the 2000s, since when it has covered about 20,000 miles on tours and been very well cared-for. 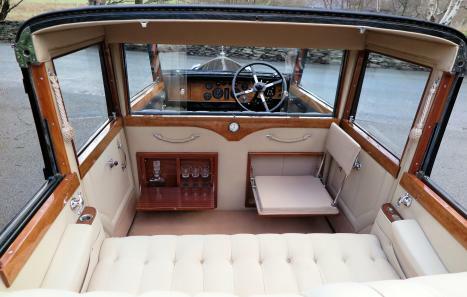 Fully re-painted in black & Ivory & re-upholstered in black leather to the front and beige cloth rear, all to a high standard, superbly re-finished woodwork with an attractive veneer pattern, lovely chromework, etc. 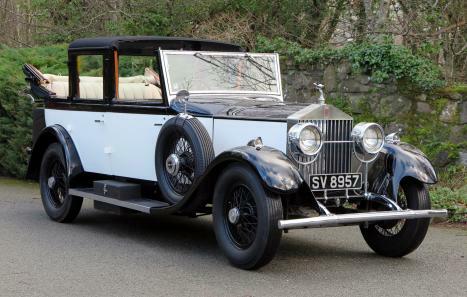 Structurally excellent, being strongly built as all Brewster bodies of the period seem to have been, and incorporating some interesting and appealing features, including 'drum' headlights, unusual sidelights, tubular bumpers, etc. Also fitted with a useful, large, rear-mounted trunk. 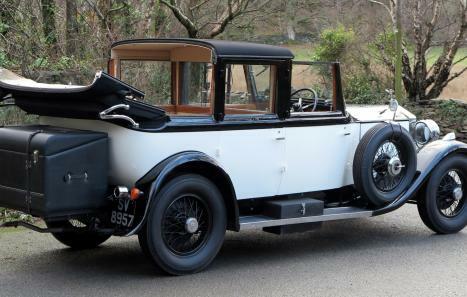 Mechanically excellent too, having had, amongst much else, a full engine overhaul, and fitted with overdrive, power steering and much more besides to make it into the excellent car that it is today. MoT'd until February 2020. The first owner of GSR65 was Frederick Foster Brewster, a Second Cousin of William Brewster the coachbuilder. The Brewster family are descended from William Brewster (his sons were named Love & Wrestling!) a Mayflower Pilgrim and the family tree show many diverse business interest including Gold Miners, Merchants, Coachbuilders, Railway Owners, Steamers, Varnishes and Finance. Frederick Foster Brewster grandfather, Patrick was the brother of James Brewster, the founder of Brewster Coachworks & the grandfather of William Brewster whose company built the Landaulette de Ville body that GSR65 wears. Frederick’s father Benjamin joined the 1849 California Gold Rush and opened a trading store with Oliver Burr Jennings, the partners returned to New York in 1874 where Oliver married William Rockefeller’s sister & became involved in Standard Oil as indeed did Benjamin Brewster who also became a Railway Magnate & Steamship owner, Jennings and Brewster also became in-laws when their children Oliver Gould Jennings & Mary Dows Brewster got married. At Benjamin’s funeral (1897) the list of pallbearers was a Who’s Who of American Magnates: J. D. Rockefeller, R. R. Cable, C. S. Fairchild, C. Griscom, C. A. Peabody, H. H. Rogers, W. M. Burr & H. W. Curtis – the net worth of just these eight individuals would have been eye watering. In 1906 Frederick Foster Brewster (1872/1958) purchased “Ivy Nook” a 25 acre estate from Eli Whitney and promptly tore down the house to replace it with a mansion “Edgerton” designed by R S Stephenson as a wedding gift for his wife for them to use as their “retreat” from the City. In 1948 GSR65 was acquired by Colonel Robert Asa Lincoln Bentley of East 49th Street of New York in the area known as “Turtle Bay”. The Colonel retired from the Army in 1957 having served on the staff of Lord Louis Mountbatten in S.E. Asia and the Colonel’s postings included Burma, China, India, Tokyo, Greenland and of course New York. He was an active member of many associations including Knight Templar, Masons (32 degree), the Circumnavigators Club & The Order of Lafayette. After the Colonel’s retirement from the Army in 1957 he & Mrs Bentley became prominent figures in New York Society; from 1957 until 1968 the Colonel was Senior Consultant for Robert Bentley Associates in New York.